Open cut sewer excavation is a popular method for sewer replacement and new sewer lateral installation in NJ. A trench is excavated so that lengths of pipe can be installed manually. 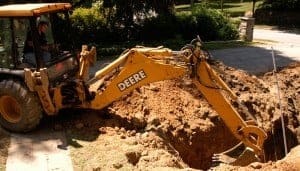 Existing sewer pipes that need replacement can be removed after sewer excavation, and when the installation is completed, the trench is backfilled, with seeds or sod applied to restore grass and vegetation over the excavated area. Sewer repair companies will begin by inspecting the slope and elevation of the area where the new pipe is going to be laid. These considerations help contractors lay the pipes in ways that minimize the risk of clogging, as well as avoiding unstable soil that could lead to bellying or pipe collapse. Then, sewer service contractors will calculate the idea pitch for the new sewer pipes. Subtracting the elevation at the start and end points from the length of the pipe will yield the drop per foot. An ideal drop per foot for sewer line installation shouldn’t exceed 1/4″; this helps ensure that solids and liquids flow at the same rate, reducing the risk of a clogged sewer line. The actual sewer excavation now begins. Contractors will dig a trench, removing loose dirt to create a smooth surface along the bottom. 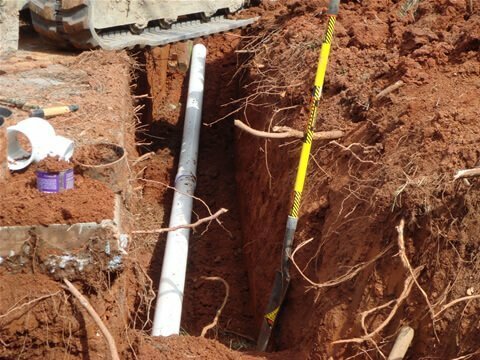 In areas with relatively soft soil, sand is often added to prevent the pipe from sinking downward. The new sewer pipes are installed along the bottom of the trench. After installation, sand or gravel is laid over the top of the pipe. Then, the trench is backfilled with soil. Sewer excavation can also be used for sewer repairs, instead of trenchless techniques. In areas that aren’t paved, sewer excavation can sometimes be more cost effective than alternatives like pipe bursting. It also doesn’t require contractors to remove roots or debris beforehand, further cutting back on time and cost. 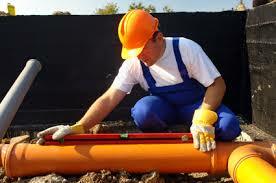 Sewer excavation and sewer relining are both widely used by NJ sewer pipe repair contractors. Each approach to sewer repair has its own advantages and disadvantages, which homeowners and contractors take into consideration before deciding on a repair method. Some of the advantages of sewer excavation for sewer repair include cost considerations. In some locations, sewer excavation can be a less costly option that trenchless repairs. This applies especially to severely damaged pipes or very heavy root infestation. Damage to paved areas. If a damaged sewer pipe runs underneath driveways, sidewalks, and other paved areas, sewer excavation will require the pavement to be broken apart. This can make the sewer repair process more costly and disruptive. Landscape disruption. Sewer excavation will tear up your lawn and landscaping directly over the sewer line. Over time, seeds or sod can replace grass and vegetation in the backfilled area, but excavation for sewer repairs can still leave your yard looking temporarily blemished. Minimal excavation. Other than two access points, not much digging is needed for CIPP sewer repairs. Pavement won’t need to be removed or replaced. As long as sewer repair contractors can access the access point, pavement over the sewer line isn’t much of a concern. Jointless pipe liners. Pipe liners are seamless and jointless, so they don’t leave openings through which tree roots can enter the sewer line. Cost. In some areas without overlying pavement, CIPP could cost more than sewer excavation. Roots and debris must be removed before CIPP sewer relining. Before contractors can insert a new liner, the pipe needs to be cleaned out first. Any tree root growth, clogs, and debris need to be removed– usually with hydro jetting– before repairs can take place. Limitations. CIPP only works on structurally intact pipes, not on pipes that have burst or collapsed. It also may not be applicable in cases of severe root blockage that can’t be cleared out with high pressure water jetting. Like CIPP sewer relining and sewer excavation, pipe bursting has its own unique set of pros and cons. Minimal excavation is required. For pipe bursting, sewer repair contractors won’t have to do much digging. This helps keep your lawn, yard, and driveway intact. Jointless pipe. Like CIPP sewer relining, pipe bursting introduces a seamless new segment of pipe with no joints, reducing the risk of tree root incursion or water leaks. Diameter of the existing pipe can be increased. New pipes inserted with pipe bursting can be slightly larger than the old pipe. Cost. Sewer excavation for sewer repairs can sometimes be less expensive than pipe bursting. Roots and debris must be removed. As with CIPP sewer relining, any obstructions need to be removed from the old pipe before contractors can use pipe bursting machinery to replace it. Not applicable in all cases. Although pipe bursting can fix pipes with more damage than pipes suitable for CIPP lining, a sewer pipe can still be so severely damaged that pipe bursting isn’t a viable option. Your local sewer repair company will be able to advise you on what your best options are for fast, effective solutions to your sewer problems. Trenchless repairs can be used in many cases, but there are still situations where sewer excavation is best.